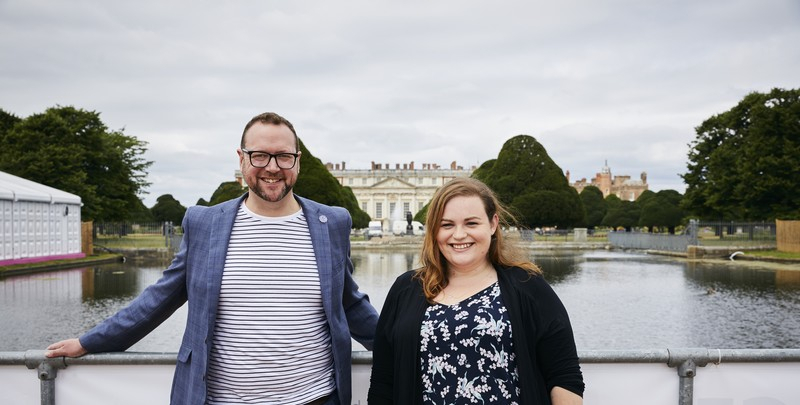 Yesterday we were lucky enough to visit Hampton Court Flower Show on Press Day and visit not one but three beautiful show gardens including our products! Our first stop was ‘Brownfield Metamorphosis’ designed by Martyn Wilson of Wilson Design Associates. The garden was built by Keyscape Design & Construction and sponsored by St Modwen Properties Plc. 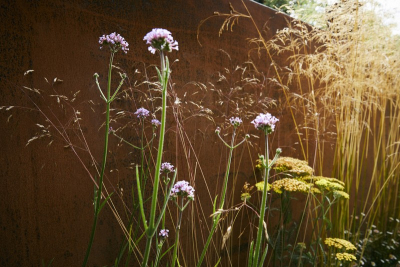 We provided five of our large corten steel walls and we were amazed at how Martyn presented them so beautifully. 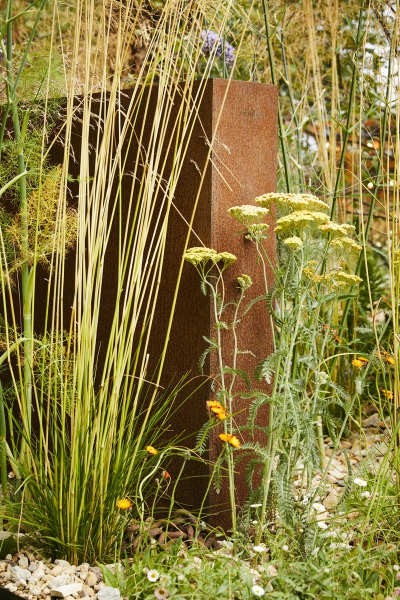 The rich and rusty tones of the corten steel supplied represented manufacturing and gave a harsh industrial feel that when coupled with soft wild planting made for a beautiful juxtaposition. 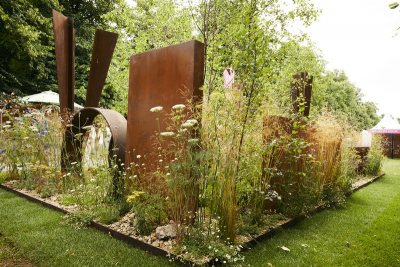 We later heard that ‘Brownfield Metamorphosis’ won a Gold medal so a huge congratulations to Martyn! 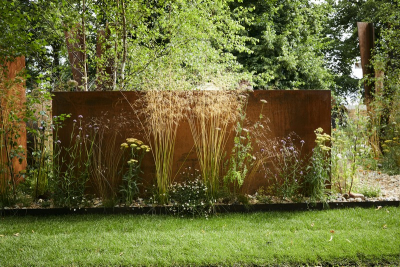 Our corten steel walls are available in standard sizes as well as bespoke. View them here. Our next stop was ‘A Place to Meet’ designed and sponsored by The Association of Professional Landscapers. Planting scheme by VaRa Garden Design. 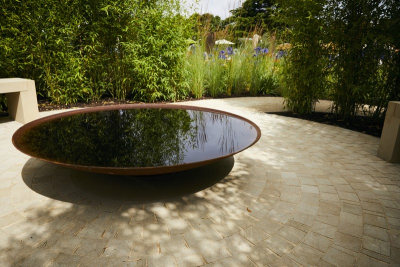 We were pleased to provide two of our 120cm water bowls at the front of this beautifully designed space to relax and chat. The way the bowls have been layered isn’t something we have seen in a project before, but it made for an interesting feature and contrast against the soft floral tones and white paving. Finally we visited the ‘Perennial Sanctuary Garden’ built by Landform Consultants and designed by Tom Massey. 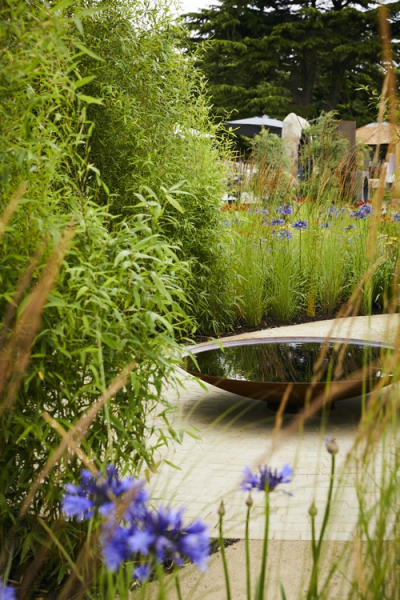 After providing the 150cm corten steel water bowl we were extremely grateful when Laura from Perrenial invited us to come to the show and see the garden in person. 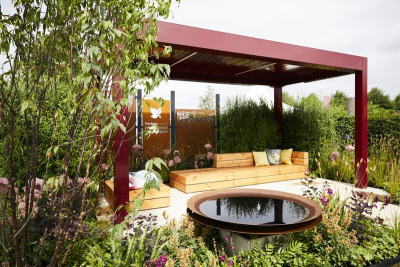 Tom has used spiral paths surrounded by beds of beautiful plants in red and purple feeding into a central area with an impressive bamboo screen offering privacy and calm. Within this area are two benches with our water bowl in the middle. The calm and protection you feel inside this area of the garden is indicative of the relief and help that Perennial provide to clients. 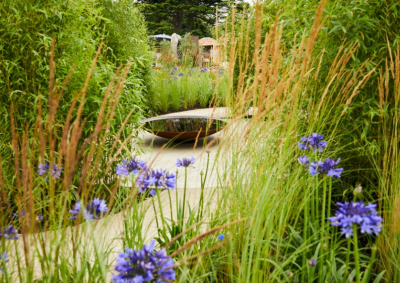 The ‘Perrenial Sanctuary Garden’ was awarded a well-deserved Silver Gilt. 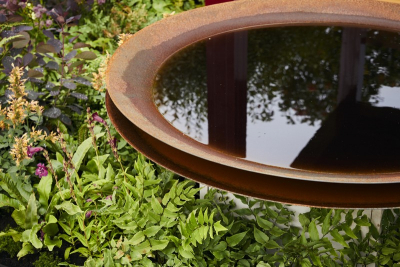 We're running a special competition for the length of the flower show where you can win a 60cm version of the corten water bowls used at the show! All you need to do is follow us on Twitter, Instagram, Pinterest or Like us on Facebook. We loved every minute of Hampton Court and advise anyone who is able to go and see this years gardens for themselves! To enquire about any of our products seen at the show contact our sales team on 01892 890 353 or email us at sales@thepotco.com. If you’re interested in our products for your own show garden contact katie@thepotco.com.